I actually use the microwave. My wife doesn't care for Oatmeal. So, since it is just for me, it is easier that way. Plus, less dishes to wash.
5 minutes on medium, go do some stuff. Stir in the nuts, honey and fruit. Then 7 minutes on medium low, go do some more stuff. And breakfast is ready. My rice cooker doesn't have a porridge setting or timer (I wish I'd splurged for the one that did). Wow Erik cute kitties. Two of my present three are sisters, the first siblings I've adopted. I've been searching for this! 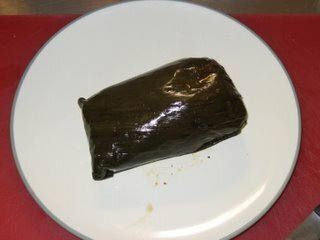 Has a method or recipe been here on eG somewheres all along? 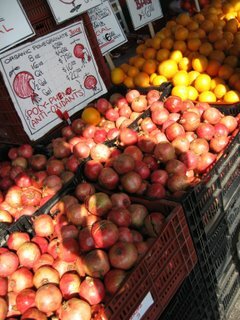 Local poms are cracking ripe. 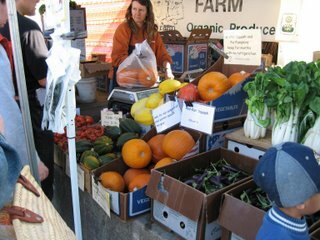 I like your local market... it is an incomparable gift, one's local market being a good one. What? I can make oatmeal in the microwave ? Real oatmeal ? This could be very important. I don't like oatmeal (I actually loathe it) - but my sister-in-law, who does not cook, loves oatmeal. In particular, she loves the McCann's Steel Cut Irish Oatmeal. And sometime it is very nice to make oatmeal for someone who loves it. Wait - you are talking of porridge. But sometimes you say oatmeal. Ok - I am going to go do some reading on the subject. But suffice to say, I would love to see precise instructions on your oatmeal/porridge microwave method. Microwaved Scottish-style oats, you say? Now that has possibilities. I'm assuming the yogurt gets stirred in afterwards (so as not to kill the wee good beasties contained therein)? 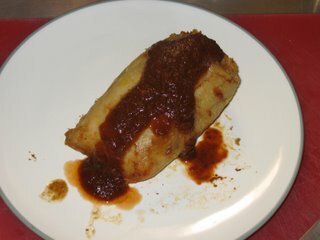 --comparing and contrasting "mission style" Mexican food vs. the SoCal-Mex style prevalent here in San Diego. The burritos with everything but the kitchen sink in them, and the breakfast burritos, have definitely made themselves known in this town, with unique ingredient variants such as french fries. But if you do some poking around, you can find more authentically Mexican items, especially the soft tacos with variety meats that I love. --extremely cute kitties! I too was overcome with "awwwwwwww" at that shot of your cats in their youth, perching on their pet human. --the salute to cheap-but-good kitchen cutlery. --porridge! I make a big bowl of congee for my lunch at least once a week, usually more often than that; sometimes I make my own mongrel variant using rolled oats instead of rice, but with the same proportion of broth-to-grain as "normal" congee. 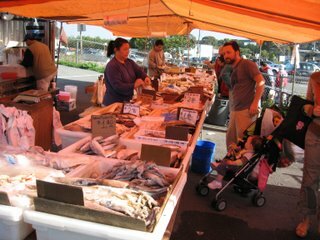 --Asian markets! I adore wandering around them, trying to figure out what stuff is and how it's used. And I'm always impressed by the everything-but-the-oink pork offerings in the meat departments. --Manhattans, and other cocktails. As some in the booze section of eGullet may recall, I'm sorta trying to persuade myself out of my Manhattan rut, which is proving difficult since the Manhattan suits my tastes so very well. ... gratuitous Firesign Theatre references! I know there is some more complicated method involving actual pomegranates on here some where; but, the search function is failing me this evening. Will try to follow up with proper method. Yes, absolutely, the oats are cooked, and the yoghurt not added until after the whole has cooled down enough to be consumed. You know, I had absolutely no hope that anyone would get that. Just threw it out there to entertain myself. You, mizducky, have earned at least several delicious manhattans should you choose to enter the geographic area near San Francisco. Thank you! Another reason to revisit your fair city, which I've been meaning to do for some time now. It may be awhile, but I'll definitely let you know when it happens. ...and then I took a picture of my soup noodles. Hmmm... that indeed looks very delicious! Is it a Malaysian Curry Mee? I wish I can find something like that in Sacramento. 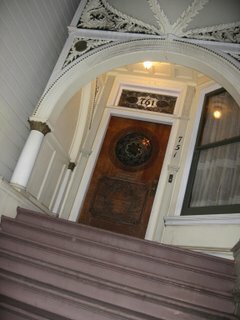 Next time I visit SF, I think I need to look that up! Geeks get hungry 2! usually ~midnite! 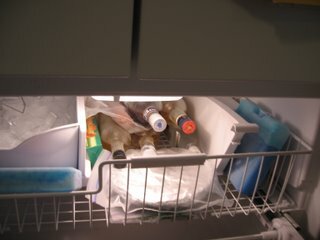 Am just the tiniest bit jealous of your American-style refrigerator this morning after trying to freeze a batch of mole this week and realizing that my two (2) European fridges combined have approximately the freezer storage capacity of, say...a briefcase. 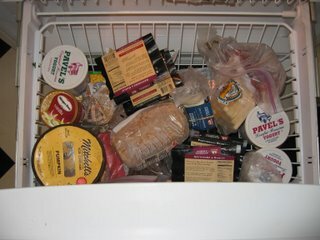 The upside is that it's pretty easy to have a "fully stocked freezer"...one bag of frozen catfish will do it. 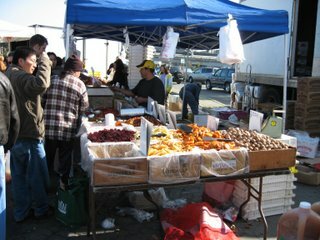 At 9th and Irving, near work, there are a lot of lunch options. We're spoiled for choice, really. 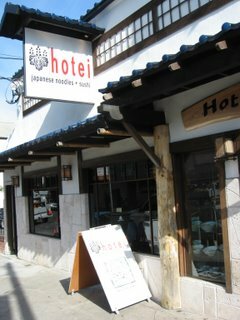 Hotei has tasty Japanese food. 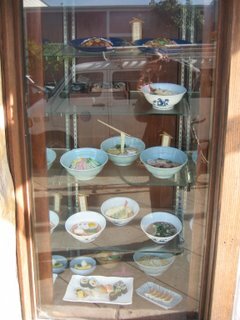 Noodles in soup, that sort of thing, as you can see from their window display. Their sister restaurant, across the street, Ebisu, has pretty good sushi. 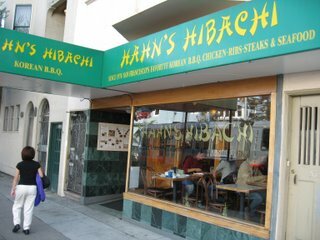 There is also Hahn's Hibachi. I'm not an expert on Korean food, so I can't tell you if it is authentic or not. It is tasty, though. 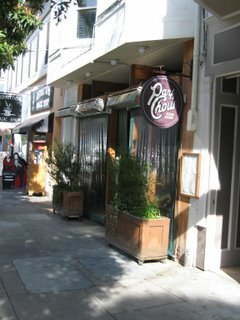 But, one of my favorite restaurants in San Francisco is Chow. This is the Park Chow outpost. There is also another Chow near Church and Market and another in Lafayette. Inside is warm and inviting. If you are by yourself, you can sit at the bar. 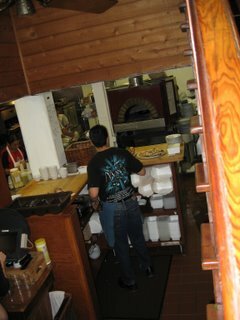 Much of the food is cooked in a wood oven. 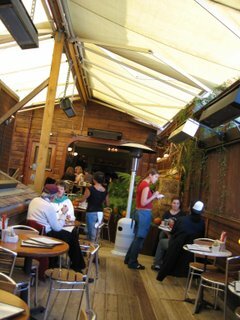 They also have a rooftop area for eating, with a spiffy retractable awning for when the weather is nice. 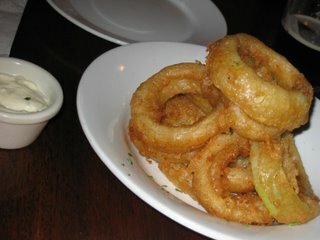 They have a small-ish menu, which is adjusted seasonally, and is served for lunch and dinner. 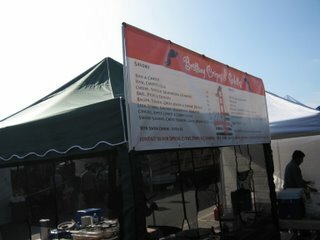 They also do a brunch, which I have never tried. 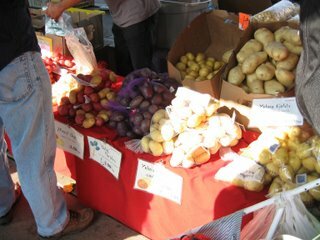 Produce and meats are sourced locally or organically. 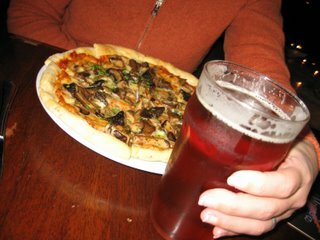 It centers around the wood oven pizzas, grilled items, and pastas. 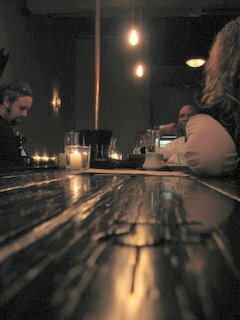 Eclectic wine list, tasty beers on tap (Russian River, Moonlight Brewing, Anchor Steam, Speakeasy), and well made fresh juice coolers. 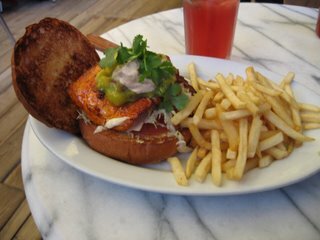 Sandwich of the day is Sole with some sort of avocado mango salsa. For high quality, reasonably priced food, it really is hard to beat Chow. 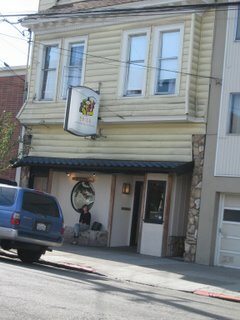 I'm not normally a big Haight Street fan; but, it does have a very good brew pub, a new bar I like, and the best beer bar in San Francisco. 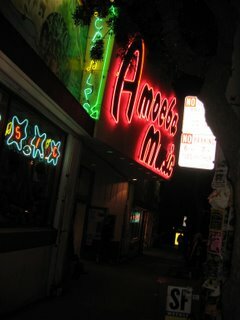 Of course, it also has the San Francisco outpost of Amoeba Records. 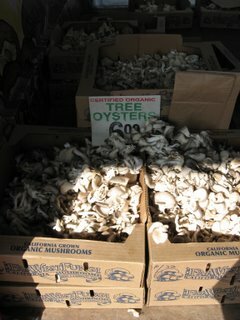 When we first moved to California, far too much of our disposable income was spent at the Berkeley store. First stop is this non-descript store front near the Red Vic Theater. 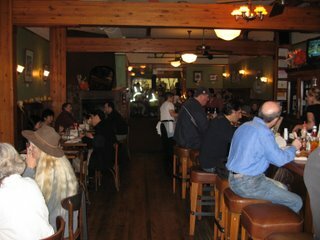 Inside you'll find a nice long wooden bar (made from recycled wood from Kezar stadium seats). 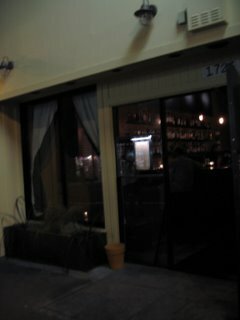 The Alembic was opened a couple months ago by the same folks who own the Magnolia Brewpub. 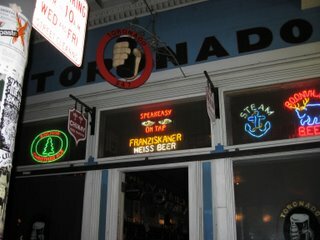 Its high quality cocktails, friendly staff, and great selection of booze have made it a regular stopping place for me on the way home from work. I tried a Presidente Vincent tonight. It's quite tart and delicious. My wife meets me, and we toddle on down to our dinner destination. 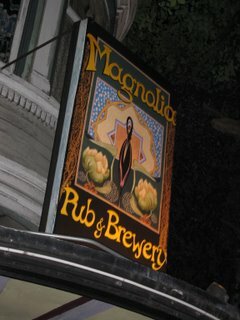 The Magnolia Brewpub has been around for several years and makes several outstanding beers. Their pumpkin beer this year was one of the best I've tasted. I think the chef has been tweaking the menu lately, and none of this is quite as outstanding as we remember on previous occasions. 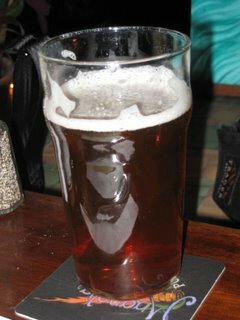 The beer, however, is still very good. 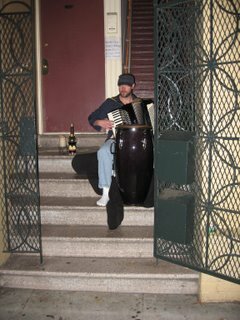 Nice people sitting in their candle lit doorways, drinking wine, and playing the accordion (quite competently, I must say). Beautiful old homes. 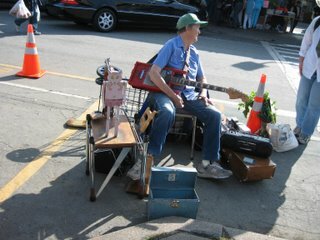 Sometimes the Haight isn't so bad. 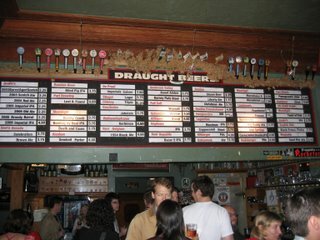 They have an amazing list of draught beers. 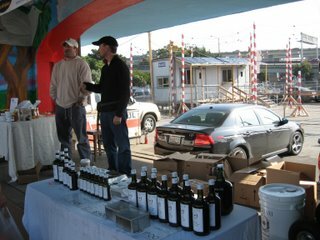 And an even more amazing list of bottles from around the world. Some sort of excitement at the bar catches our eye. 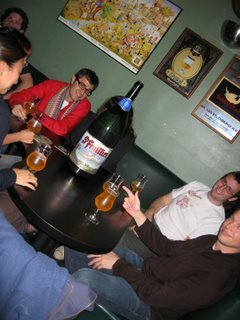 These people have ordered the most enormous beer I have ever seen. I'm glad I won't have their hangovers tomorrow! 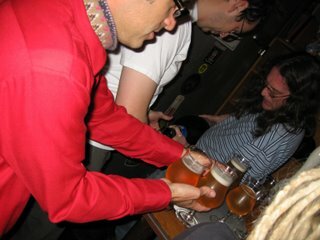 Again, some of that beer got away before I could snap a photo! 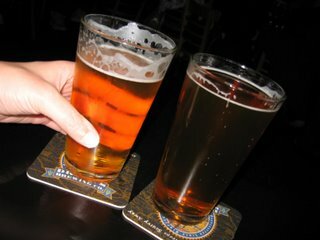 We stick with old favorites, Russian River Blind Pig IPA and a Moonlight Brewing Reality Czech. Eventually, all things must end, and we walk down to Church and Market to catch a J train home. 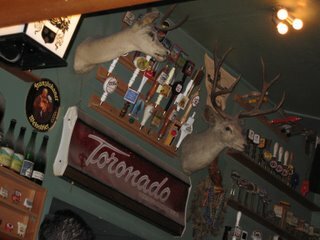 Walking down Cortland Avenue, I snap a photo of our local watering hole. 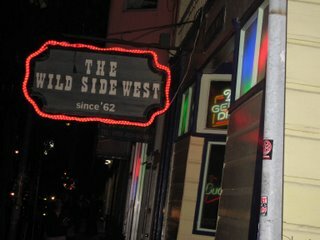 Wild Side West is a nice bar with a great patio and garden out back. There are a number of Vietnamese style noodle places right there at 19th and Irving. A bunch of them start their names with P.P.Q. I often wonder if they are all related, or if that means something else. There is also the P.P.Q. Dungeness Island over in the Richmond, which I have yet to visit. 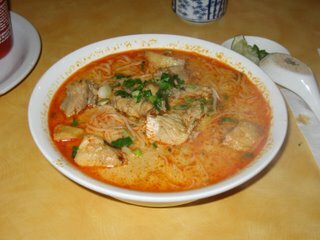 There's usually some sort of spicy Curry Chicken soup on the menu in Vietnamese noodle places, and this was actually a very tasty example. 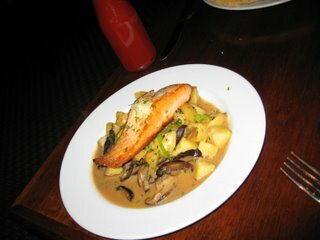 Coconut Milk, lots of tasty seasonings, potatoes, and there had to be more than a quarter of a chicken in the soup. I chickened (haha) out and didn't get the "Chicken & Innards Noodle Soup". Sorry to torture you with a week of oatmeal! I use the term porridge generically. I guess it could be grits or kasha or whatever. So far this week, it's been all oatmeal. The night before, toast the oats in a dry pan until they smell like popcorn. 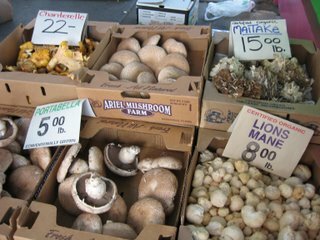 Put them in a bowl and cover them with the amount of water you will use to cook. I usually use 1/3 cup of oats and 1 cup of water. Put saran over them and stash them in the fridge. The next morning, put the bowl in the microwave and cook on Medium. Microwaves vary, so I can't tell you exactly what will work for you. It pays to experiment with an oversize bowl, as over flow is no fun. I do 5 minutes for the first cook. 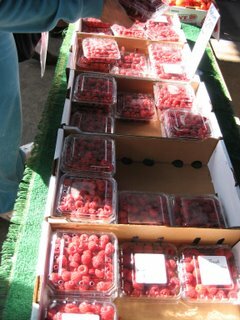 Take them out, stir in the sweetener and dried fruit. Some people like to add a pinch of salt. Microwave again, this time on Medium Low. 7 minutes works for me. Stir in Yoghurt and serve. Is this just a more fancy name for a Margaritas? Or there are more to it? The Presidente Vincent is a Rum drink, making it more like a dressed up Daiquiri. It has light rum, dry vermouth, sugar, and lime. 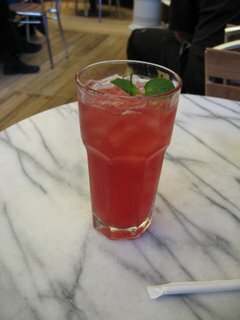 They serve it here with a sugar rimmed glass. Thank you Erik. They seem to look very similar. Margaritas... popular cocktail in Mexico... pale green, lime on rim, salt on rim. 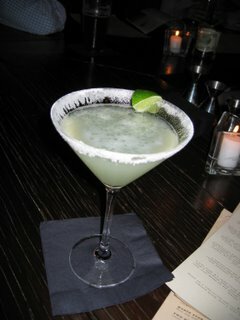 Your picture of Presidente Vincent... pale green, lime on rim, (what looked like) salt on rim. Google first before posting stupid questions. I also thought it was a margarita, based on the same train of thought that you had. Oops! I was cleaning up the photos on the camera and didn't export today's porridge! Today was Scottish style Oats with walnuts, dried Prunes, dried figs, and yoghurt. 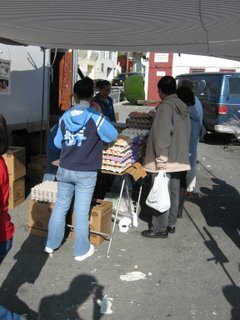 The first thing you likely see when you get to the Alemany Farmers' Market is this truck. 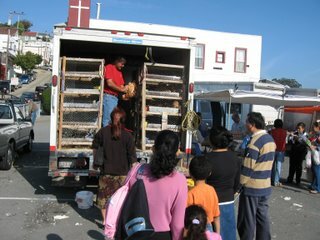 We like to think of it as the mobile chicken adoption facility. 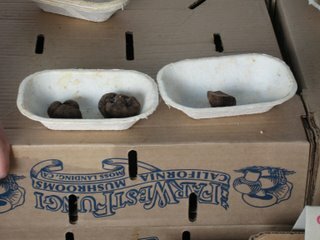 If you don't want to save a chicken, you can just save an egg or two. 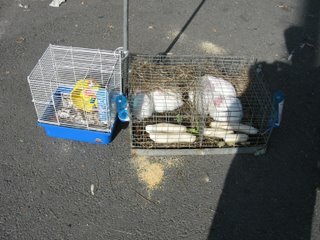 Bunnies and hamsters. I'm pretty sure the hamsters are for actual pets. 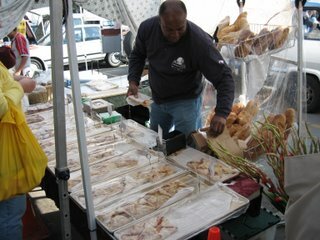 There is also a pretty big fish market stand that sets up every week. I've never bought anything from them, so I can't vouch for quality. 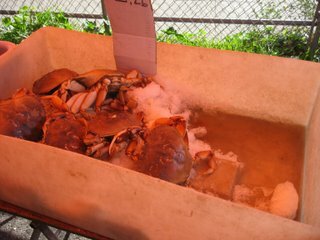 Dungeness Crab Season started this week! I get the dried fruit I use in my oatmeal from these folks. Ferrari Farms. 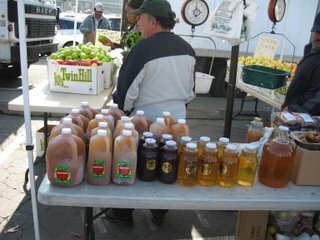 Twin Hill from Sebastapol is also here every week with apples and juices. These people have the best kiwis. I don't believe I had really tasted a good kiwi until I had one of theirs. Plus, you can get a deal on the mis-shapen ones. 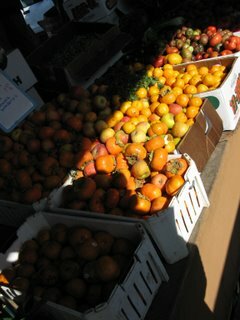 Persimmon season is in full swing. 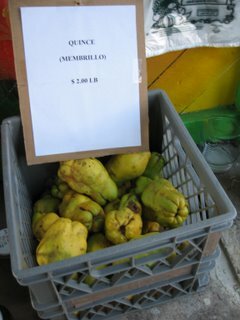 Have gotten really tasty squash from these folks. The Bariani folks are usually there. 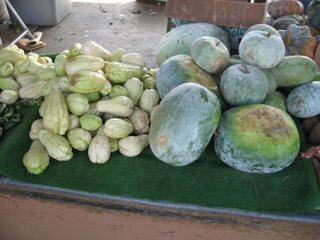 I think these are winter melons on the right? 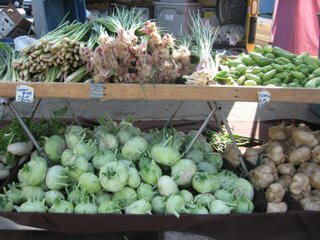 Chayote on the left. These people's booth is always really busy. 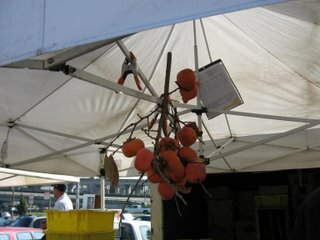 They sell Guavas, Persimmons, Calamansi, and other citrus. 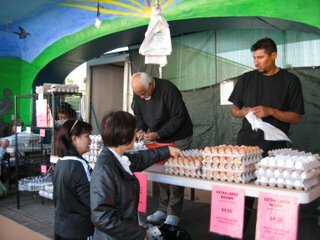 We get our eggs from the Haney Farms booth. 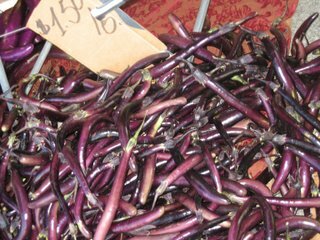 I think these are some sort of bean. Anyone know what sort? 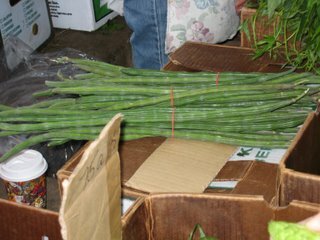 There is also a booth that sells huarachas (sp?) which are quite tasty. 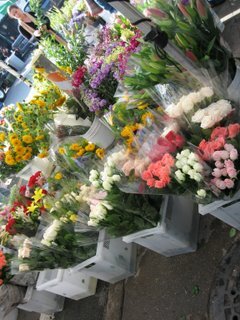 My wife likes to buy flowers here. They are quite reasonable. This nice gentleman sells bread and pastries. A bunch of prepared food places have sprung up lately, like this crepe place. 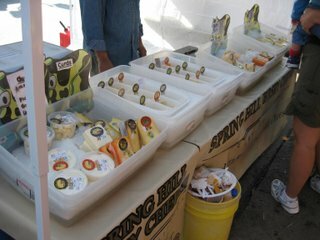 Spring Hill Cheese. They actually sell cheese curds! Spicy firehouse cheddar also tasty. 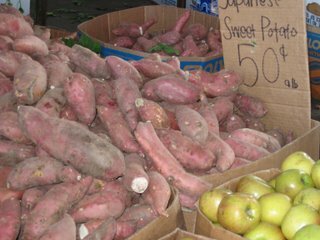 These folks specialize in exotic potatoes. 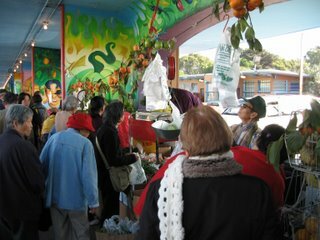 One of my favorite booths is this one which sells Asian Pears. 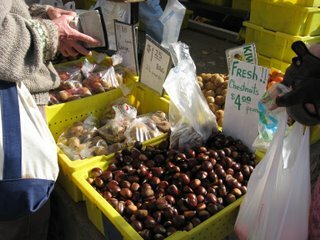 It is an older Asian couple and they are only there in the fall and winter. Very tasty! 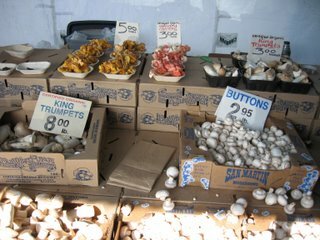 The nice folks from Far West Fungi sell their wares at our market as well as the one down town. These people specilize in dates. They come up from Palmdale every week. 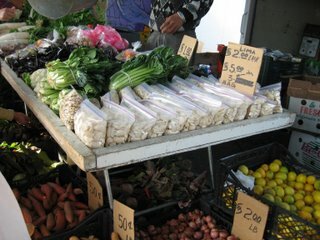 You can buy shelled black eye peas and limas. And we have entertainment for the children. 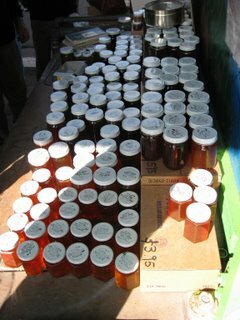 Jan C. Snyder from La Honda has the best honey. Along with a lot of native wild flower honeys, he sells propolis, royal jelly, and all sorts of other odd things. My favorite honey name is, "Wooly Blue Curls". Today I tried a new one I'm not sure I liked called, "Tarweed". 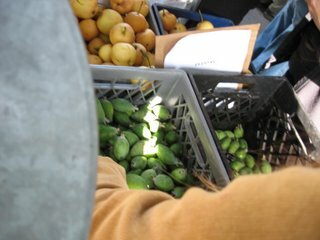 Pineapple Guava (Feijoa) are also in season now. 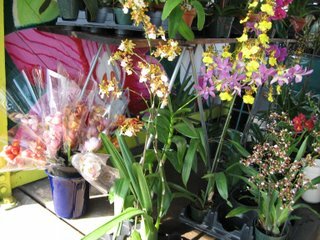 There are several orchid vendors, as well as the other flower vendors. 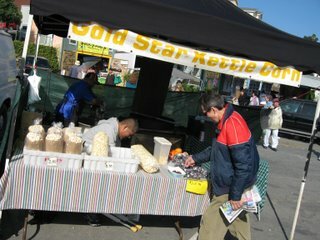 And of course, Kettle Corn. 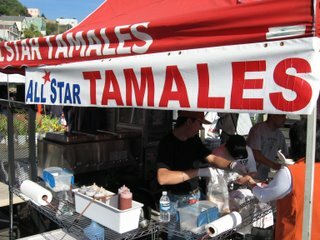 For lunch, I had a Pork Mole tamale from All Star Tamales. 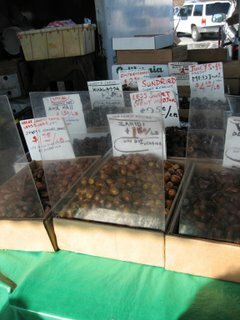 Until I came to USA, that's the only variety of eggplants I knew. 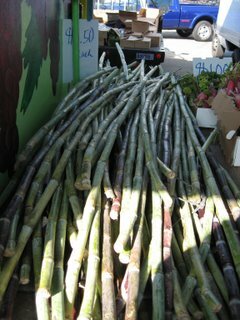 I didn't know eggplants can be so thick! 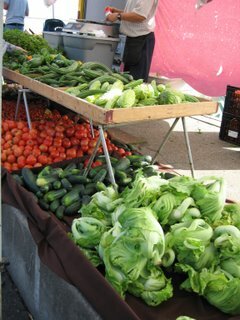 Looks like your farmer's market carries quite a bit of Asian vegetables. 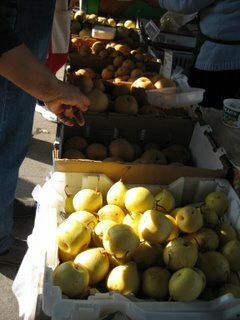 Asian pears are in season only in the winter. 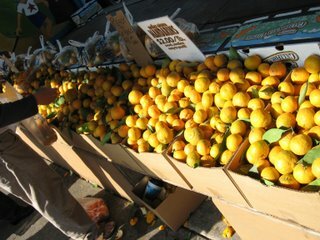 The yellow ones, especially if from Tian Jien, are really sweet. My favorite!